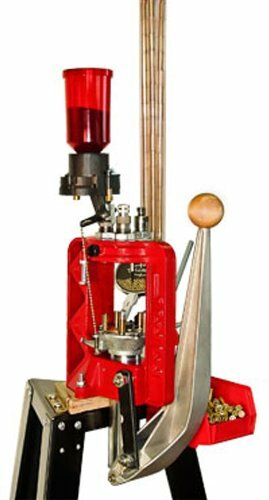 The Lee Precision Load Master Reloading Kit features a large 1 3/4 inch diameter ram with a stroke clearance big enough for even the largest magnum rifle cases. It can be used as an automatic indexing progressive press or as a single stage press, and its five stations accept most popular reloading dies. Dies are held by a detachable turret that allows them to be removed and reinserted without adjusting.